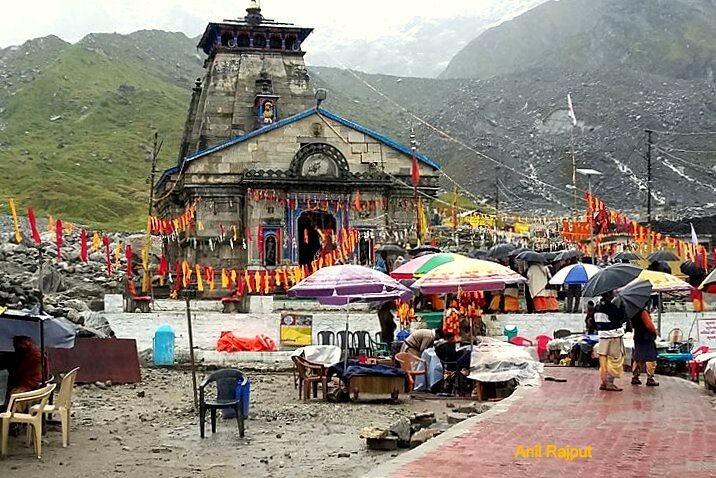 Char Dham Yatra is the holiest of journey for Hindus in Uttarakhand Himalayas, this pilgrimage starts with the opening of the doors (Kapat) of four temples, are closed during the winters due to heavy snow , normally opening of doors is announced on Shivaratri. This year 2016 journey starts from 8th May with opening of Kapats (Doors) 09 May Sri Yamunotri, Sri Gangotri 09 May, Sri Kedarnath and Sri Badrinath on 11May. The journey starts from Rishikesh full day road journey passing through Dharsu, Sayanachatti and Barkot, entire route is full of beautiful view of snow capped Banderpunch Range, Pine forests and water falls, pilgrims stay at Hanuman Chatti or Barkot, where most of the hotels, guest houses and dharamshalas are situated, it is also confluence of river Hanuman Ganga and river Yamuna . Next day one is to cover 6 Kms by Jeeps/SUVs up to Janki Chatti , there are guest houses with basic facilities at Janki Chatti the trek 6 Kms . to the Yamunotri Temple starts from here , it is on the left bank of the river, a hot water spring is near the temple the “Surya Kund” , pilgrims tie potatoes and rice in cloth dip in boiling hot water of Surya Kund , so cooked rice is taken as prasad back home, pilgrims take bath at “Gauri Kund“ which has hot water suitable for bathing. Prayers are offered first at the “Divya Shila“ a Black stone slab then in the Temple. The actual source of river is further ahead 1 Km at Champasar Glacier on Kalind Mountain, it is very difficult to reach there, people offer the prayers at the temple situated at the foot hill . Pilgrims return same day and take rest for the next day onward journey to the Gangotri. To reach Gangotri we have to returned to Dharsu and then drive to Uttarkashi to reach Harsil a 250 Kms drive, it is a small town famous for its natural beauty, apple orchards, trekking routes to lakes and undiscovered stretches of grassy meadows. One can reach Gangotri by road from here distance 23 Kms passing through pine forests , transport is available till the Temple dedicated to Goddess Ganga, on the banks of River Bhagirathi, the glacier mouth is further ahead 18 kms trek, towards Gaumukh, The Ganges is known as Bhagirathi here, it unites with Alaknanda at Devprayag to form Ganges. Temple is at a very picturesque location amidst high mountains , towards east is the Gaumukh Glacier. It is here the Bhagirath shila where King Bhagirath performed the tapasya to bring Ganga from the heavens to earth, water is ice cold here , it is difficult to stay in water for even half a minute. This place is at a height of 3142 meters . Those who want to trek to Gaumukh can spend two more days, which needs clearance from the local authorities, the trek passes through Chirwasa and Bhojwasa, Gaumukh is one of the Largest Glacier in the World, on the way one can find the Ibexes(Snow Goat) grazing on high mountains, the opening of glacier to from where it releases water to form Bhagirathi is a shape of Cows mouth that is why it is called Gaumukh. From here one can have a panoramic view of mountains, Shivaling (6540 meters), Meru (6660 meters) and Bhagirathi (6500 meters). Next place in Chardham Yatra is Sri Kedarnath, Harsil to Uttarkashi is 69 Kms, then to Guptkashi is 230 kms, Total journey time is about 10 hrs. Passing through Srinagar, Uttarakhand, This route is followed by River Mandakini. Hotels, camps and guest houses at Guptkashi are available at a very reasonable price. Morning starts by a travel upto Gauri Kund , a motor able road or to Phata from where Helicopter Service is available to Kedarnath. Gauri Kund the starting point of Kedarnath trek is a hot water spring, here the Goddess Parvathi lived and performed sadhna to please Lord Shiva to finally got married to him. It is also the place where Lord Ganesha acquired the elephant head. 15 kms trek from here is very tough and takes about 4-5 hours. Rambara . From Rambara the Yatris cross the River Mandakini to reach Limchuli and then to Kedarnath temple . It is at the height of 3585 meters situated near the head of river Mandakini, surrounded by snow capped mountains, it’s name is derived from the King Kedar in the Satya Yuga, his daughter Vrinda who is also an incarnation of Goddess Lakshmi, this temple existed in the Mahabharata period, when Pandavas performed tapasya (prayers) to please Lord Shiva. It was here the Adi Shankaracharya took samadhi at the age of 32 years, soon after establishing the four sacred dhams, it is considered a must visit place, there is a small hot water spring which gives relief to the pilgrims from the tiredness of hard journey, there are dharamsalas, camps and small guest houses, the temple opens at 6 o’clock in the morning and closes in the evening, Kedarnath is the highest among the 12 Jyotirlings, it is built of massive stone slabs over a rectangular platform, here Lord Shiva who was evading the Pandavas hide himself as a bull, on being followed, he dived in the ground leaving behind the hump, the conical rock inside the temple is worshiped as Lord Shiva in his Sadashiva form, outside the temple there is a large statue of Nandi Bull as a guard. After the floods of year 2013 a big boulder named as Divya Shila is also worshiped as it saved the temple by obstructing the flow of flood water to cause any damage to the temple. One has to be careful while staying at night here because of low oxygen concentration at this altitude. Pilgrims are advised not to exert themselves too much and breathe normal. Staying overnight and performing poojas in the morning one returns to Gauri Kund and drive to Joshimath, there are two routes, one is which normally pilgrims take is driving through Rudrapryag, second is through Chopta which is the most beautiful, passing through dense forests of Mandal and Gopeshwar, from Chopta one can take a trek to Tungnath, it is Lord Shiva’s temple situated at about 4 kms trek from Chopta. Drive to Joshimath is about 7 hrs. It is better to stay night in Joshimath and take a morning drive to Sri Badrinath a 44 kms distance is very rough and takes about 4 hrs drive , on the way is Gobind Ghat from where trek for The Hemkund Sahib, Laxman Temple and Valley of Flowers starts. Shri Badrinath Dham is the temple dedicated to lord Vishnu’s dual form Nara-Naryana, the temple is 15 meters tall with top covered with gold gilt roof, it is built of stone with arched windows, the main entrance is a arched gate, inside is mandapa a large pillared hall leading to the Garbha Griha. It is surrounded by Nara-Narayan peaks and in the backdrop is the Neelkanth peak. Legends says that to reduce the impact of Ganga on earth it was split into twelve rivers and one of them is river Alaknanda, the other legend is that the Pandavas passed through Badridham and to Mana village to ended their life by climbing the heights of peak Swargarohini, there is a cave near the village Mana where the Vyas Rishi complied the Mahabharata. Before entering the temple, pilgrims must take bath in hot water spring at the Tapta Kund and Surya Kund fed by thermal sulphar springs, the boiling hot water falls into ice cold water of Alaknanda creates the steam over the water surface. North of the temple is a Bharama Kapal where Lord Bharama is said to reside, here the last rites of departed souls are performed. There are lots of other places around like foot prints of Lord Narayana on rock is about 3 kms called Charan Paduka, over a kilometer on the other side of river is Shesh Netra, the eye of Shesh Nag on which the Lord Vishnu rests is seen on a rock, about 8 km. is the source of Alaknanda the Bhagirath Kharak and Satopantha Glaciers this place is called Alka Puri. One can return same day to Joshimath or stay one night to visit all these places. Sri Badri Dham is also referred as Badri Vishal thus giving the supreme status among the all Dhams. One may stay a full day at Joshimath , take an excursion to Auli which is at the height of 3050 meters, there are Taxis available to reach a famous winter sports destination for Skiing, there is a rare medicinal plants nursery and little above one can trek to Gorson, Tali, Kauri Pass, Khulara and Tapovan. One can have a panoramic view of Himalayan mountain range of Nanda Devi (7818 meters), Mana (7272 meters), Kamet (7728 meters), Mount Neelkanth, Mount Chaukhamba (6874 meters), Mount Hathi Ghora Palki. One can also visit Vishnu Pryag, the confluence of River Alaknanda and Dhauli Ganga from Joshimath . Return journey starts from Joshimath passing through Rudraprayag and Srinagar, Dev Prayag and reaching Rishikesh/Hardwar a 250/275 km. journey for a night stay, participating at Aarti at Ganga Ghats and to leave for home next day.